The history of Albania emerges from the pre-history of the Balkan states more than 3000 BC, with early records of Illyria in Greco-Roman historiography. It's identity stretched widely over the Balkan peninsula and gradually got smaller in the present day western Balkans. The modern territory of Albania had no counterpart in the standard political divisions of classical antiquity. Rather, its modern boundaries correspond to parts of the ancient Roman provinces of Dalmatia (southern Illyricum), Macedonia (particularly Epirus Nova), and Moesia Superior. The territory remained under Roman and Byzantine control until the Slavic migrations of the 7th century. It was integrated into the Bulgarian Empire in the 9th century. The territorial nucleus of the Albanian state was formed in the Middle Ages as the Principality of Arbër and a Sicilian dependency known as the medieval Kingdom of Albania. The area was part of the Serbian Empire, but passed to the Ottoman Empire in the 15th century. It remained under Ottoman control as part of the province of Rumelia until 1912, when the first independent Albanian state was founded by an Albanian Declaration of Independence following a short occupation by the Kingdom of Serbia. The formation of an Albanian national consciousness dates to the later 19th century and is part of the larger phenomenon of the rise of nationalism under the Ottoman Empire. A short-lived monarchical state known as the Principality of Albania (1914–1925) was succeeded by an even shorter-lived first Albanian Republic (1925–1928). Another monarchy, the Kingdom of Albania (1928–39), replaced the republic. The country endured an occupation by Italy just prior to World War II. After the collapse of the Axis powers, Albania became a communist state, the Socialist People's Republic of Albania, which for most of its duration was dominated by Enver Hoxha (died 1985). Hoxha's political heir Ramiz Alia oversaw the disintegration of the "Hoxhaist" state during the wider collapse of the Eastern Bloc in the later 1980s. The communist regime collapsed in 1990, and the former communist Party of Labour of Albania was routed in elections in March 1992, amid economic collapse and social unrest. The unstable economic situation led to an Albanian diaspora, mostly to Italy,Greece, Switzerland, Germany and North America during the 1990s. The crisis peaked in the Albanian Turmoil of 1997. An amelioration of the economic and political conditions in the early years of the 21st century enabled Albania to become a full member of NATO in 2009. The country is applying to join the European Union. Albania ( al-bay-nee-ə,; Albanian: Shqipëri/Shqipëria; Gheg Albanian: Shqipni/Shqipnia), officially known as the Republic of Albania (Albanian: Republika e Shqipërisë), is a country in Southeastern Europe. It is bordered by Montenegro to the northwest, Kosovo to the northeast, Former Yugoslavian Republic of Macedonia to the east, and Greece to the south and southeast. It has a coast on the Adriatic Sea to the west and on the Ionian Sea to the southwest. It is less than 72 km (45 mi) from Italy, across the Strait of Otranto which links the Adriatic Sea to the Ionian Sea. This is the most recent version of the Albanian flag out of a long history of the similar Albanian flags used. The flag features a double-headed eagle in black, on a red background. This design is traced back to the royal seal of the noble house of George Castrioti Skanderbeg, an Albanian King, and a 15th century Turkish general. The symbol represented the supreme deity and has its roots deep into the Albanian culture and traces its origin from the Ilirio-Pelasgian antiquity and it is part of the Albanian cultural heritage, hence the Albanian flag. The symbol was also adopted by the Roman Emperor Constantine I (Saint Constantine The Great), being of Illyrian origin, this is said to be also the symbol of his family which he turn into into the symbol of the Byzantine Empire with the capital city named after him, Constantinople. Albania is the Medieval Latin name of the country, which is called Shqipëria by its people, from Medieval Greek Ἀλβανία Albania, besides variants Albanitia or Arbanitia. The origin of the Albanians has been for some time a matter of dispute among historians which is something that has to do more with politics rather than academia. However, due to linguisics and genetic studies on the origin of the Albanian people, historians conclude that the Albanians are descendants of populations of the prehistoric Balkans, such as the Pelasgian race, via the various Illyrian, Dacian and/or Thracian tribes. Little is known about these people, and they blended into one another in Thraco-Illyrian and Daco-Thracian contact zones even in antiquity. The Albanian people are widely accepted by many historian as the direct decedents of the Pelasgain people via the Illyrian tribe of the Albani. The name Pelasgians ﻿(/pəˈlæzdʒiənz, -dʒənz, -ɡiənz﻿/; Greek: Πελασγοί, Pelasgoí; singular: Πελασγός, Pelasgós) were the indigenous people of the Balkan Peninsula. Fathers to many nations, it was the name used by some ancient Greek writers to refer to populations that either were the ancestors of the Greeks or preceded the Greeks in Greece, "a hold-all term for any ancient, primitive and presumably indigenous people in the Greek world". In general, "Pelasgian" has come to mean more broadly all the indigenous inhabitants of the Aegean Sea region and their cultures before the advent of the Greek language. This is not an exclusive meaning, but other senses require identification when meant. During the classical period, enclaves under that name survived in several locations of mainland Greece, Crete, and other regions of the Aegean. Populations identified as "Pelasgian" spoke a language or languages that at the time Greeks identified as "barbaric", even though some ancient writers described the Pelasgians as Greeks. A tradition also survived that large parts of Greece had once been Pelasgian before being Hellenized. These parts generally fell within the ethnic domain that by the 5th century BC was attributed to those speakers of ancient Greek who were identified as Ionians. The Illyrians (Ancient Greek: Ἰλλυριοί, Illyrioi; Latin: Illyrii or Illyri) were a group of Indo-European tribes in antiquity of Pelasgian race, who inhabited part of the western Balkans and the south-eastern coasts of the Italian peninsula (Messapia). The territory the Illyrians inhabited came to be known as Illyria to Greek and Roman authors, who identified a territory that corresponds to the former Yugoslavia and Albania, between the Adriatic Sea in the west, the Drava river in the north, the Morava river in the east and the mouth of the Aoos (Vjosa) river in the south. The first account of Illyrian peoples comes from the Periplus of Pseudo-Scylax, an ancient Greek text of the middle of the 4th century BC that describes coastal passages in the Mediterranean. These tribes, or at least a number of tribes considered "Illyrians proper" of which only small fragments are attested enough to classify it as a branch of Indo-European; it was probably extinct by the 2nd century AD. The term "Illyrians" last appears in the historical record in the 7th century, referring to a Byzantine garrison operating within the former Roman province of Illyricum. All the remaining tribes except perhaps the Romanized Vlachs were Slavicised in the course of the early Middle Ages. The modern Albanian language is likely to have descended from a southern Illyrian dialect. During the time of the Trojan War, the Pelasgians were known as the allies of the Trojans. ﻿Born in Emathia of an Epiriote Princess, Alexander the son of Philip II of Macedon, was not a true heir of the throne of the Kingdom of Macedonia but rather was risen to power by his “arrogant, headstrong and meddlesome…” mother, Olympia, who was the driving force behind his success. Olympia, a wildly beautiful woman, was from the noble house the Molossians, direct decedents of Achilles, which explained Alexander’s obsession with the Trojan War and concurring of the East. Phillip II, was a polygamist and his marriage to Olympia was a diplomatic move to establish peace and to settle the conflict among the Pelasgian tribes while also a strategic move to create an alliance with her uncle, the King of Epirus (Present day Albania). Even though Phillip fell in love with Olympia while being intimate with her during a religious ritual Snake Cult, likely mimicking the Pelasgian Myth of Creation, his relationship with Olympia was not a good one. Phillip regarded her as a “barbarian” and a sorceress and often would find her in bed with snakes. According to the writings of ancient writer Plutarch, this was how Alexander was conceived. He claims that Olympias was impregnated not by Philip, who was afraid of her and her affinity for sleeping in the company of snakes, but by Zeus. Plutarch (Alexander 2.2-3) relates that both Philip and Olympias dreamt of their son's future birth. Olympias dreamed of a loud burst of thunder and of lightning striking her womb. In Philip's dream, he sealed her womb with the seal of the lion. Hence the prophesied birth of Alexander is what gave him his name, “A le, si Ander” which in Pelasgian (Albanian) can be translated as “born like the dream”. The importance of his birth is also affirmed by Italian historian, Valerio Massimo Manfredi, in his bestseller book called “Alexander; Child of a Dream”. 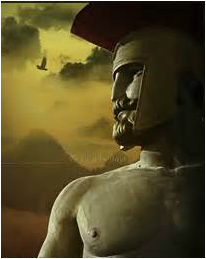 Due to Phillip’s rough nature, aggression toward's Olympia and taunting of him, young Alexander found affinity on his mother's side and looked up to a father figure in Olympia's kin, his first mentor, Leonidas of Epirus. It wasn't until he rode the horse that no man could, when Olympia finally convinced Phillip that their son needed more than just military training. It was then when Phillip sough out the best tutor for him; the one who spoke the mother tongue and who studied under Plato, the Thracian Aristotle. It was through Aristotle that Alexander learned how to "speak Greek" and about the Hellenic culture. After the death of Phillip, the proclaimed son of Zeus and that of the princess of Epirus, claimed the throne of Macedon and went to conquer the known world. He was known as Alexander of Emathia (of the Great one) or simply, Alexander the Great. He was from the tribe of the Molossians and related to Alexander the Great from his mother’s side. Was almost also named Alexander, he was an exceptional general and the only one who defeated the Romans in their own soil. His victory came at a devastating loss of his army. From this, we get the modern term “Pyrrhic Victory”, a victory that inflicts such a devastating toll on the victor that it is tantamount to defeat. He was the prince of Epirus and only 3 years old when his family was killed in an uprising. His was saved by the Illyrian King Glaucus, of the Taulanti, who adopted the boy and raised among his sons. Testimony of the kinship along the Illyrians and Epiriotes, is showed when King Glaucus places him at the throne of Epirus at the age of 17. He inherited the name which we know him to today, Pyrrhus. It is likely that the name was a Roman pronunciation as in the language of his people, he was called “Pirro”. Historian ****** suggests that this name is a modern corruption of the word “burro” which in Albanian means “man”. Because Pyrrhus was so young and the only surviving heir of the monarchy of Epirus, being that he was adopted by the Illyrian King, Glaucia. While in the court of the Illyrian palace, he learned the art of warfare and launched his military complains which skills matched only to his cousin, Alexander the Great. After returning home gloriously from one of his battles, Pyrrhus enjoyed his fame and reputation, and being called "Eagle" by the Epirots, "By you," said he, "I am an eagle; for how should I not be such, while I have your arms as wings to sustain me?" Essentially implying that his people were all "Eagles", the nickname "Shqipe" (Eagle) which is still used among Albanians to show respect towards one another. In the First Illyrian War, which lasted from 229 BC to 228 BC, Rome's concern with the trade routes running across the Adriatic Sea increased after the First Punic War, when many tribes of Illyria became united under one queen, Teuta. The death of a Roman envoy named Coruncanius on the orders of Teuta  and the attack on trading vessels owned by Italian merchants under Rome's protection, prompted the Roman senate to dispatch a Roman army under the command of the consuls Lucius Postumius Albinus (consul 234 and 229 BC) and Gnaeus Fulvius Centumalus. Rome expelled Illyrian garrisons at the cities of Epidamnus, Apollonia, Korkyra, Pharos and others and established a protectorate over these Greek towns. The Roman Navy's first crossing of the Adriatic Sea in 229 BC involved Rome's first invasion of Illyria, the First Illyrian War. The Roman Republic finally completed the conquest of Illyria in 168 BC by defeating the army of the Illyrian king Gentius. Shortly after the whole Illyrian (Balkan) peninsula was incorporated into the Roman Prefecture of Illyricum where the present day ethnic Albanian region was divided into the administrative provinces of Illyria, Macedonia, Dardania and Epirus. Distinguishing themselves as prominent warriors, the Illyrian soldiers moved up the ranks as became generals and then emperors of the Roman Empire. The Illyriciani or Illyrian Emperors, as they were otherwise know as, were a group of Roman emperors during the Crisis of the Third Century who hailed from the region of Illyricum (the modern western Balkans), and were raised chiefly from the ranks of the Roman army (whence they are ranked among the so-called "barracks emperors"). In the 2nd and 3rd centuries, the Illyricum and the other Danubian provinces (Raetia, Pannonia, Moesia) held the largest concentration of Roman forces (12 legions, up to a third of the total army), and were a major recruiting ground. . The Slavs migrated in successive waves. Small numbers might have moved down as early as the 3rd century however the bulk of migration did not occur until the late 6th century AD. Very little is know of their origin, but they occupied most of the Eastern Roman Empire, pushing downwards the Roman Province of Illyricum towards present day Greece. Most still remained subjects of the Roman Empire, but those that settled in the Pannonian plain were tributary to the Avars. By the 6th Century, the numbers of Illyrian people were greatly decreased by the previous barbarian incursions which left a vacuum later to be filled by southern slavs. This caused the remaining Illyrian tribes to either assimilate or push southward to present day Albania. Many fled to mountainous areas or to the refuges of the cities on the Adriatic coast. When the Slavs arrived, they were the first barbarian tribes to actually settle in the area permanently. They assimilated many of the native Balkan people. However those who ventured downward and took to the mountains of southern Illyria, found refuge among their kin and retained their own cultures and language: scholars believe that these tribes are the ancestors of the Albanian people. In his History written in 1079-1080, Byzantine historian Michael Attaliates referred to the Albanoi as having taken part in a revolt against Constantinople in 1043 and to the Arbanitai as subjects of the duke of Dyrrachium. It is disputed, however, whether that refers to Albanians in an ethnic sense. However a later reference to Albanians from the same Attaliates, regarding the participation of Albanians in a rebellion in 1078, is undisputed. At this point, they are already fully Christianized. In the late 11th and 12th centuries, the region played a crucial part in the Byzantine–Norman Wars; Dyrrhachium was the westernmost terminus of the Via Egnatia, the main overland route to Constantinople, and was one of the main targets of the Normans (cf. Battle of Dyrrhachium (1081)). Towards the end of the 12th century, as Byzantine central authority weakened and rebellions and regionalist secessionism became more common, the region of Arbanon became an autonomous principality ruled by its own hereditary princes. In 1258, the Sicilians took possession of the island of Corfu and the Albanian coast, from Dyrrhachium to Valona and Buthrotum and as far inland as Berat. This foothold, reformed in 1272 as the "Kingdom of Albania", was intended by the dynamic Sicilian ruler,Charles of Anjou, to become the launchpad for an overland invasion of the Byzantine Empire. The Byzantines however managed to recover most of Albania by 1274, leaving only Valona and Dyrrhachium in Charles' hands. Finally, when Charles launched his much-delayed advance, it was stopped at the Siege of Berat in 1280–1281. Albania would remain largely under Byzantine control until the Byzantine civil war of 1341–1347, when it fell to the hands of the Serbian ruler Stephen Dushan and became part of the Serbian Empire. Ottoman supremacy in the west Balkan region began in 1385 with the Battle of Savra. On the conquered part of Albania, which territory stretched between Mat River on the north and Çameria to the south, Ottoman Empire established the Sanjak of Albania (also known as Arvanid Sancak) and in 1419 Gjirokastra became the county town of the Sanjak of Albania. Beginning in the late-14th century, the Ottomans expanded their empire from Anatolia to the Balkans (Rumelia). By the 15th century, the Ottomans ruled most of the Balkan Peninsula. Their advance in Albania was interrupted in the 15th century, when George Kastrioti Skanderbeg, the Albanian national hero who had served as an Ottoman military officer, renounced Ottoman service, allied with some Albanian chiefs forming the League of Lezhë and fought off successfully Turkish rule from 1443–1468 upon his death. Skanderbeg frustrated every attempt by the Turks to regain Albania, which they envisioned as a springboard for the invasion of Italy and western Europe. His unequal fight against the mightiest power of the time won the esteem of Europe as well as some support in the form of money and military aid from Naples, the papacy, Venice, and Ragusa. Three major attacks (Siege of Krujë (1450), Second Siege of Krujë (1466–67), Third Siege of Krujë (1467)) suffered Albania during this period from major armies led by the great Ottoman sultans themselves, Murad II and Mehmed II The Conqueror. Albania was almost fully re-occupied by the Ottomans in 1479 after capturing Shkodër from Venice. Albania's conquest by Ottomans was completed after Durrës's capture from Venice in 1501. Given their skills as warriors, many Albanians had been recruited into the Janissary corps, including the feudal heir George Kastrioti who was renamed Skanderbeg (Iskandar Bey) by his Turkish trainers at Edirne. After some Ottoman defeats at the hands of the Hungarians, Skanderbeg deserted on November 1443 and began a rebellion against the Ottoman Empire. After deserting, Skanderbeg re-converted to Roman Catholicism and declared war against the Ottoman Empire, which he led from 1443 to 1468. Under a red flag bearing Skanderbeg's heraldic emblem, an Albanian force held off Ottoman campaigns for twenty-five years and overcame sieges of Krujë led by major forces of the Ottoman sultans Murad II and Mehmed II.For 25 years Skanderbeg's 10,000 man army marched through Ottoman territory winning against consistently larger and better supplied Ottoman forces. Throughout his rebellion,Skanderbeg defeated the ottomans in numerous battles such as in Torvioll, Oranik, Otonetë and Mokra.Hist most brilliant being in Albulena. However, Skanderbeg was unable to receive any of the help which had been promised him by the popes or the Italian states, Venice, Naples and Milan. He died in 1468, leaving no worthy successor. After his death the rebellion continued, but without its former success. The loyalties and alliances created and nurtured by Skanderbeg faltered and fell apart and the Ottomans reconquered the territory of Albania, culminating with the siege of Shkodra in 1479. Shortly after the fall of the castles of northern Albania, many Albanians fled to neighboring Italy, giving rise to the modern Arbëreshë communities. Skanderbeg’s long struggle to keep Albania free became highly significant to the Albanian people, as it strengthened their solidarity, made them more conscious of their national identity, and served later as a great source of inspiration in their struggle for national unity, freedom, and independence. Upon the Ottomans' return in 1479, a large number of Albanians fled to Italy, Egypt and other parts of the Ottoman Empire and Europe and maintained their Arbëresh identity. Many Albanians won fame and fortune as soldiers, administrators, and merchants in far-flung parts of the Empire. As the centuries passed, however, Ottoman rulers lost the capacity to command the loyalty of local pashas, which threatened stability in the region. The Ottoman rulers of the 19th century struggled to shore up central authority, introducing reforms aimed at harnessing unruly pashas and checking the spread of nationalist ideas. Albania would be a part of the Ottoman Empire until the early 20th century. After the death of Skanderbeg and more than a decade of fighting, Albania would eventually succumb to Ottoman rule. The Ottoman period that followed was characterized by harsh economic times, a change in the landscape through a gradual eastern modification of the culture with the introduction of bazaars, military garrisons and mosques in many Albanian regions. Both forced conversion and poor economic conditions, led parts of the Albanian population gradually converting to Islam, with many joining the sect of the military order of Islam called the Sufi Order of the Bektashi . Converting from Christianity to Islam brought considerable advantages, including access to Ottoman trade networks, bureaucratic positions and the army. Because of their military talents, many Albanians where recruited to serve in the elite order of the Ottoman army called the Janissary unit and others in the administrative Devşirme system. Many Albanians moved up the military ranks and gained prominent positions in the Ottoman government, with no fewer than 42 Grand Viziers of the Empire were of Albanian descent. The Ottoman period also saw the rising of semi-autonomous Albanian ruled Pashaliks and Albanians were also an important part of the Ottoman army and Ottoman administration like the case of Köprülü family. Albania would remain a part of the Ottoman Empire as the provinces of Scutari, Monastir and Janina until 1912. ﻿By the 1870s, the Sublime Porte's reforms aimed at checking the Ottoman Empire's disintegration had clearly failed. The image of the "Turkish yoke" had become fixed in the nationalist mythologies and psyches of the empire's Balkan peoples, and their march toward independence quickened. The Albanians, because of the higher degree of Islamic influence, their internal social divisions, and the fear that they would lose their Albanian-populated lands to the emerging Balkan states--Serbia, Montenegro, Bulgaria, and Greece—were the last of the Balkan peoples to desire division from the Ottoman Empire. As the Ottoman Empire began to weaken, uprising in the region of Rumelia lead to The Greek War of Independence (1821–1829), also commonly known as the Greek Revolution. After a long and bloody struggle, and with the aid of the Great Powers, independence was finally granted by the Treaty of Constantinople in July 1832. Central to the Greek Revolution were the Arvanite and the Albanian Cam tribe of the Suliotes. A major contributor of the Greek Revolution was the Albanian ruler of Epirus, Ali Pasha Tepelena. In response to the Serbian invasion of Albanian lands in the Villayete of Kosovo in the late 1800's, the Albanian beys (lords) united in the city of Prizren against the Serbian occupation. They soon gain support from all Albanian Villayets as Greece and Montenegro also started a bloody compain for the Albanian territories. The Sublime Porte, fearing that it would lose its grip on the western Balkans, initially supported the Albanian resistance against the newly formed Kingdoms of Serbia, Greece, Montenegro and Bulgaria. Ottomans cancelled their support when the League, under the influence of Abdyl bey Frashëri, became focused on working toward Albanian autonomy and requested merging of four Ottoman vilayets (Kosovo, Scutari,Monastir and Ioannina) into a new vilayet of the Ottoman Empire (the Albanian Vilayet). The League used military force to prevent the annexing areas of Plav and Gusinje assigned to Montenegro by the Congress of Berlin. After several battles with Montenegrin troops, the league was defeated by the Ottoman army sent by the Sultan. The Albanian uprising of 1912, the Ottoman defeat in the Balkan Wars and the advance of Montenegrin, Serbian and Greek forces into territories claimed as Albanian, led to the proclamation of independence by Ismail Qemali in Vlora, on 28 November 1912. In Vlora, on the 15th/28th of November. The President of Albania was Ismail Kemal Bey, who spoke of the great perils facing Albania today, the delegates have all decided unanimously that Albania, as of today, should be on her own, free and independent. 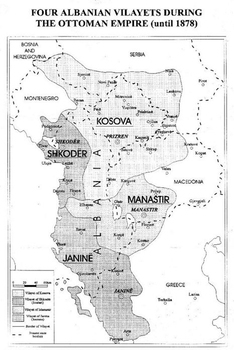 Albania's independence was recognized by the Conference of London on 29 July 1913, but the drawing of the borders of the newly established Principality of Albania ignored the demographic realities of the time given Albanian territories to the neighboring countries, Greece, Serbia, Montenegro and Macedonia. As a result 3/4th of the Albanian territories with 80% Albanian majority where left out. The International Commission of Control was established on 15 October 1913 to take care of the administration of newly established Albania until its own political institutions were in order. Its headquarters were in Vlorë. The International Gendarmerie was established as the first law enforcement agency of the Principality of Albania. At the beginning of November the first gendarmerie members arrived in Albania. Wilhelm of Wied was selected as the first prince. The First Balkan War (Albanian: Lufta Ballkanike, Bulgarian: Балканска война, Greek: Α΄ Βαλκανικός πόλεμος, Serbian: Први балкански рат Prvi Balkanski rat, Turkish: Birinci Balkan Savaşı), which lasted from October 1912 to May 1913, comprised actions of the Christian Balkan league (Serbia, Greece, Montenegro and Bulgaria) against the Ottoman Empire. The combined armies of the Balkan states overcame the numerically inferior and strategically disadvantaged Ottoman armies and achieved rapid success. As a result of the war, the allies captured and partitioned almost all remaining European territories of the Ottoman Empire. Being that the independence of Albania died with the League of Prizren, the region was still under Ottoman rule and it became a main target for the Christian Balkan League as they each manifestied their bloody expansion onto Albanian lands. The Serb army first entered Ottoman territory inhabited by ethnic Albanians in October 1912 as part of its campaign in the then-ongoing First Balkan War. The Kingdom of Serbia occupied most of the Albanian-inhabited lands including Albania's Adriatic coast. Serbian Gen. Božidar Janković was the Commander of the Serbian Third Army during the military campaign in Albania. The Serbian army met with strong Albanian guerrilla resistance, led by Isa Boletini, Azem Galica and other military leaders. During the Serbian occupation, Gen. Jankovic forced notables and local tribal leaders to sign a declaration of gratitude to King Petar I Karađorđević for their "liberation by the Serbian army". The army of the Kingdom of Serbia captured Durrës on 29 November 1912 without any resistance. Right after their arrival in Durrës, on 29 November 1912, the Kingdom of Serbia established Drač County, its district offices and appointed the governor of the county, mayor of the city and commander of the military garrison. During the occupation, the Serbian army committed numerous crimes against the Albanian population "with a view to the entire transformation of the ethnic character of these regions." The Serbian government denied reports of war crimes. Following the signing of the Treaty of London in May 1913 which awarded new lands to Serbia, including most of the former Vilayet of Kosovo, the Serbian government agreed to withdraw its troops from outside of its newly expanded territory. This allowed an Albanian state to exist peacefully. The final withdrawal of Serb personnel from Albania was in October 1913. Shkodër and its surrounding had long been desired by Montenegro, although its inhabitants were overwhelmingly ethnic Albanians. The Siege of Scutari took place on 23 April 1913 between the allied forces of Montenegro and Serbia against the forces of the Ottoman Empire and the Provisional Government of Albania. Montenegro took Shkodër on 23 April 1913, but when the war was over the Great Powers didn't give the city to the Kingdom of Montenegro, which was compelled to evacuate it in May 1913, in accordance with the London Conference of Ambassadors. The army's withdrawal was hastened by a small naval flotilla of British and Italian gunboats that moved up the Bojana River and across the Adriatic coastline. The Greek Army controlled territory that would be later incorporated into the Albanian state before the declaration of Albanian Independence in Vlorë. On 18 November 1912, after a successful uprising and 10 days prior to the Albanian Declaration of Independence, local Maj. Spyros Spyromilios expelled the Ottomans from the Himara region. The Greek Navy also shelled the city of Vlora on 3 December 1912. The Greek Army didn't capture Vlore, which was of great interest to Italy. Greek forces were stationed in what would become southern Albania until March 1914. After the Great Powers agreed on the terms of the Protocol of Florence in December 1913, Greece was forced to retreat from the towns of Korçë, Gjirokastër and Sarandë and the surrounding territories. Under strong international pressure, Albania's Balkan neighbors were forced to withdraw from the territory of the internationally recognized state of Albania in 1913. The new Principality of Albania included only about half of the ethnic Albanian population, while a large number of Albanians remained in neighboring countries. In supporting the independence of Albania, the Great Powers were assisted by Aubrey Herbert, a British MP who passionately advocated the Albanian cause in London. As a result, Herbert was offered the crown of Albania, but was dissuaded by the British Prime Minister, H. H. Asquith, from accepting. Instead the offer went to William of Wied, a German prince who accepted and became sovereign of the new Principality of Albania. The Principality was established on 21 February 1914. The Great Powers selected Prince William of Wied, a nephew of Queen Elisabeth of Romania to become the sovereign of the newly independent Albania. A formal offer was made by 18 Albanian delegates representing the 18 districts of Albania on 21 February 1914, an offer which he accepted. Outside of Albania William was styled prince, but in Albania he was referred to as Mbret (King) so as not to seem inferior to the King of Montenegro. Prince William arrived in Albania at his provisional capital of Durrës on 7 March 1914 along with the Royal family. The security of Albania was to be provided by a Gendarmerie commanded by Dutch officers. The short-lived monarchy (1914–1925) was succeeded by an even shorter-lived first Albanian Republic (1925–1928), to be replaced by another monarchy of King Zog I (1928–1939) who intended to create a democratic and European government. Because of the territorial claims from the neighboring countries, the Albanian Monarchy sought the support of the closest European neighbor, Italy. Striving to keep its eyes in the west, the kingdom was supported by the fascist regime in Italy and the two countries maintained close relations until Italy's sudden invasion of the country in 1939. Albania was occupied by Fascist Italy and then by Nazi Germany during World War II. The Cham issue started with the invasion of southern Epirus by Greece even before the start of the first Balkan war. The first recorded massacres happen in 1913 in Paramythia leaving about 500 Cham Albanians massacred by Greek forces. expulsion of Cham Albanians from Greece was a forced emigration of thousands of Cham Albanians after the Second World War to Albania, by the Resistance National Republican Greek League (EDES) forces. The EDES and the Joint Allied Military Mission in the Axis-occupied Greece accused the Chams for collaborating with the German Nazis and Italian Fascists during the war. The Cham community had suffered horrendous crimes, discrimination since the beginning of Balkans Wars. They lost their struggle for liberation after the Greek invasion of Chameria which later lead to Greece's annexation of southern Epirus in 1913. After the annexation, the Greek government followed a forced assimilation and expulsion policy against the Cham population. While it is possible that some Chams collaborated with the Axis powers under the promise of liberation, others enlisted in the resistance forces of the Greek People's Liberation Army (ELAS) forming the Ali Demi Battalion and Chameria Battalion, fighting along side the Greek resistance and the Albanian Liberation Front (LANÇ). Greeks in opposition however, collaborated in large numbers with the Axis powers. A prime example was the Security Battalion, derisively known as Germanotsoliades or Tagmatasfalites were Greek collaborationist military groups, formed during the Axis occupation of Greece during World War II in order to support the German occupation troops. Various sources put the death toll between 200-300. The estimated amount of Albanians expelled from Chameria to Albania and Turkey varies: figures of 14,000, 19,000, 28,000 and 35,000 have been given. By the end of World War II, the main military and political force of the country was the communist party. After the liberation of Albania from Nazi occupation, the country became a Communist state, the People's Republic of Albania (renamed "the People's Socialist Republic of Albania" in 1976), which was led by Enver Hoxha and the Party of Labour of Albania. 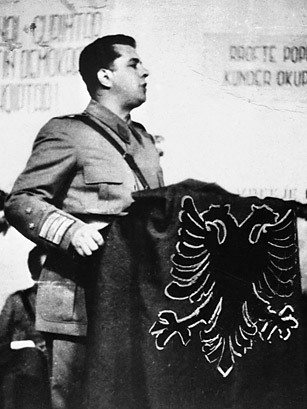 The socialist reconstruction of Albania was launched immediately after the annulling of the monarchy and the establishment of a "People's Republic". In 1947, Albania's first railway line was completed, with the second completed eight months later. New land reform laws were passed granting the land to the workers and peasants who tilled it. Agriculture began to become cooperative, and production increased significantly, leading to Albania becoming agriculturally self-sufficient. By 1955, illiteracy was eliminated among Albania's adult population. During the Communist area, Albania severed ties with the west and formed ties with Russia and later with China. The Palace of Culture of Tirana, Albania whose first stone was symbolically laid by the Russian leader Nikita Khrushchev During this period Albania became industrialized and saw rapid economic growth, as well as unprecedented progress in the areas of education and health. The average annual rate of increase of Albania's national income was 29% higher than the world average and 56% higher than the European average. Albania's Communist constitution did not allow taxes on individuals; instead, taxes were imposed on cooperatives and other organizations, with much the same effect. After the fall of the Iron Curtain, protests beginning in 1989 and reforms made by the communist government in 1990, the People's Republic was dissolved in 1991-92 and the Republic of Albania was founded. The Communists retained a stronghold in parliament after popular support in the elections of 1991. However, in March 1992, amid liberalization policies resulting in economic collapse and social unrest, a new front led by the new Democratic Party took power. In the following years, much of the accumulated wealth of the country was invested in a number of Ponzi pyramid banking schemes, which were widely supported by government officials. The schemes swept up somewhere between one-sixth to one-third of the country's population. Despite IMF warnings in late 1996, then president Sali Berisha defended the schemes as large investment firms, leading more people to redirect their remittances and sell their homes and cattle for cash to deposit in the schemes. The schemes began to collapse in late 1996, leading many of the investors into initially peaceful protests again the government, requesting their money back. The protests turned violent in February as government forces responded with fire, and in March the police and Republican Guard deserted, leaving their armories open: they were promptly emptied by a number of militias and criminal gangs. The resulting anarchy caused a wave of evacuations of foreign nationals, and of refugees. The crisis led Prime Minister Aleksandër Meksi to resign on 11th March 1997, followed by President Sali Berisha in July in the wake of the June General Election. In April 1997, Operation Alba, a UN peacekeeping force led by Italy, entered the country with two goals: Assistance in evacuation of expatriates, and to secure the ground for International Organizations. This was primarily WEU MAPE, who worked with the Government in restructuring the judicial system and police. The Socialist Party won the elections in 1997, and a degree of political stabilization followed. In 1999, the country was affected by the Kosovo War, when a great number of Albanians from Kosovo found refuge in Albania. Tensions between the Serbian and Albanian communities in Kosovo simmered throughout the 20th century and occasionally erupted into major violence, particularly during the First Balkan War (1912–13), World War I (1914–18), and World War II (1939–45). After 1945 the socialist government under Josip Broz Tito systematically repressed all manifestations of nationalism throughout Yugoslavia, seeking to ensure that no republic or nationality gained dominance over the others. In particular, Tito diluted the power of Serbia—the largest and most populous republic—by establishing autonomous governments in the Serbian province of Vojvodina in the north and in Kosovo in the south. Kosovo's borders did not precisely match the areas of ethnic Albanian settlement in Yugoslavia (significant numbers of Albanians remained in the Republic of Macedonia, Montenegro, and Preshevo valley of Serbia.) Kosovo's formal autonomy, established under the 1945 Yugoslav constitution, initially meant relatively little in practice. The secret police (the UDBA) cracked down hard on nationalists. In 1956 a number of Albanians went on trial in Kosovo on charges of espionage and subversion. The threat of separatism was in fact minimal, as the few underground groups aiming for union with Albania had little political significance. Their long-term impact became substantial, though, as some—particularly the Revolutionary Movement for Albanian Unity, founded[when?] by Adem Demaçi—would eventually form the political core of the Kosovo Liberation Army (founded in 1990). Demaci himself was imprisoned in 1964 along with many of his followers. Yugoslavia underwent a period of economic and political crisis in 1969, as a massive government program of economic reform widened the gap between the rich north and poor south of the country. All major population centers were engulfed in demonstrations by 13 March and foreign countries began to evacuate their citizens. These evacuations included Operation Libelle, Operation Silver Wake and Operation Kosmas. The United Nations Security Council, in Resolution 1101, authorized a force of 7,000 on 28 March to direct relief efforts and to restore order to Albania. The UN feared the unrest would spread beyond Albania's borders and send refugees throughout Europe. On 15 April, the 7,000 troops launched Operation Sunrise, an Italian-led mission that helped restore rule of law. After the unrest, over 25 000 guns were transported to Kosovo and the guerrilla forces of the ethnic Albanian, Kosovo Liberation Army received considerable armaments. Since 1992 Albania has been seeking a closer relationship with the West. In 1992 the Democratic Party of Albania took control of the country through parliamentary elections, deposing the Communist Party of Albania, and Sali Berisha held the premiership of the country. In 1995, Albania had been accepted into the Council of Europe and requested membership in NATO. The workforce of Albania has continued to emigrate to Western countries, especially Greece and Italy. In the early 1990s, deliberate programmes of economic and democratic reform were put in place, but Albanian inexperience with capitalism led to the proliferation of pyramid schemes – which were not banned due to the corruption of the government. Anarchy in late 1996 to early 1997, as a result of the collapse of these pyramid schemes, alarmed the world and prompted international mediation. In early spring 1997, Italy led a multinational military and humanitarian intervention (Operation Alba), authorized by the United Nations Security Council, to help stabilize the country. That summer, Berisha was defeated in elections, winning just 25 seats out of a total of 156. In the 1997 unrest in Albania the general elections of June 1997 brought the Socialists and their allies to power. President Berisha resigned from his post, and Socialists elected Rexhep Meidani as president of Albania.Albanian Socialist Party Chairman Fatos Nano was elected Prime Minister, a post which he held until October 1998, when he resigned as a result of the tense situation created in the country after the assassination of Azem Hajdari, a prominent leader of the Democratic Party. Pandeli Majko was then elected Prime Minister, and he served in this post until November 1999, when he was replaced by Ilir Meta. Pursuant to a 1991 interim basic law, Albanians ratified a constitution in 1998, establishing a democratic system of government based upon the rule of law and guaranteeing the protection of fundamental human rights. Albanians approved its constitution through a popular referendum which was held in November 1998, but which was boycotted by the opposition. The general local elections of October 2000 marked the loss of control of the Democrats over the local governments and a victory for the Socialists. Although Albania has made strides toward democratic reform and maintaining the rule of law, serious deficiencies in the electoral code remain to be addressed, as demonstrated in the June 2001 parliamentary elections.International observers judged the 2001 elections to be acceptable, but the Union for Victory Coalition, the second-largest vote recipient, disputed the results and boycotted parliament until 31 January 2002. The Socialists re-elected Ilir Meta as Prime Minister in August 2001, a post which he held till February 2002, when he resigned due to party infighting. Pandeli Majko was re-elected Prime Minister in February 2002. In the June 2005, the democratic coalition formed a government with Prime Minister Sali Berisha. His return to power in the elections of 3 July 2005 ended eight years of Socialist Party rule. After Alfred Moisiu, in 2006 Bamir Topi was elected President of Albania until 2010. Despite the political situation, the economy of Albania grew at an estimated 5% in 2007. The Albanian lek has strengthened from 143 lekë to the US dollar in 2000 to 92 lekë in 2007. In 2009 Albania – along with Croatia – officially joined the North Atlantic Treaty Organization. "The World Factbook". Cia.gov. Retrieved 2014-08-18. "Population and Housing Census 2011". INSTAT (Albanian Institute of Statistics). "Report for Selected Countries and Subjects". Imf.org. 2006-09-14. Retrieved 2014-10-07. "Human Development Report 2010". United Nations. 2010. Retrieved 5 November 2010. "Albania applies for EU membership". BBC News. 28 April 2009. Archived from the original on 30 April 2009. Retrieved29 April 2009. "Population and Housing Census in Albania". Institute of Statistics of Albania. 2011. Jump upThe American Heritage Dictionary of the English Language: Fourth Edition. 2000. Retrieved 15 January 2008. "A member of a people living in the region of the Aegean Sea before the coming of the Greeks."